I think Taylor Jenkins Reid has definitely become one of my favorite authors. I absolutely loved both The Seven Husbands of Evelyn Hugo and Daisy Jones & The Six, and have been meaning to read more of her work. So when I saw Evidence of the Affair as in the free Amazon Prime library, I knew I had to read it. Evidence of the Affair is an epistolary short story, which makes for a quick read (the audiobook is just over an hour). But even though it took me less than an hour to read, it still managed to break my heart a little. 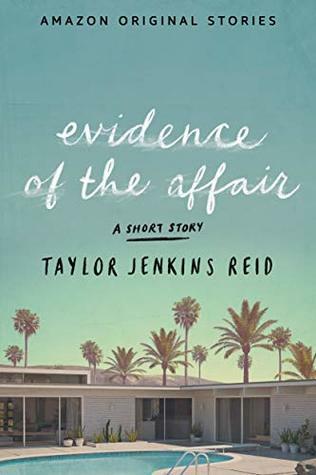 Taylor Jenkins Reid is a master of writing heart-wrenching stories that are also full of hope, and Evidence of the Affair is no exception. I was pleasantly surprised by the impact this story was able to have in so few pages. I definitely got some strong Daisy Jones vibes while reading this story. Not a huge surprise given that it’s set during the 70s in Southern California, and even has a Daisy Jones reference thrown in. Which made me super happy. There wasn’t much atmosphere in this story, but because I’m from Southern California, I could easily picture the setting – the difference between laid-back San Diego and busy LA and fancy Newport Beach. So I can see how a reader who isn’t as familiar with the setting might miss out on some of the nuances of the different places, but I don’t think it would detract from the story. I also found the characters to be surprisingly dimensional for such a short book. There is very little time to build backstory and let the readers get to know them, but TJR does it. I felt for Carrie and David – they’re both stuck in difficult, though different situations. And I felt connected enough to them that the ending nearly made me cry (I held it in because I was at work, but still). Even a day later, my heart still ached for them. ★★★★★ – I loved Evidence of the Affair. If you’re a fan of Tayloy Jenkins Reid, this is a must-read. I’d highly recommend it, even if you’re just looking for something short to help make your reading goal. Evidence of the Affair is available in the Amazon Kindle store, on Audible, or as a free Kindle book and audiobook for Prime members (you can read it on your tablet, phone, or computer if you don’t have a Kindle). Get a free 30-day trial of Amazon Prime if you’re not already a member. To get the audiobook for free (if you’re not a Prime member), use this link to sign up for a free trial of Audible and choose Evidence of the Affair as one of your two free books.